1. If you were to write a blurb in fewer than three sentences for THE REMBRANDT AFFAIR, what would it be? The Rembrandt Affair is a fast-paced thriller that will put you deep in the world of art, assassins and family secrets long thought hidden away. Great writing, a story with amazing depth that touches on the horrors of the Holocaust and its lasting effects, and a hero that will hold your attention long after the sun sets. 2. Gabriel Allon is a talented spy and assassin, but also a master art restorer. If you could have two careers that sem to be complete opposites, what would they be? I would be a Art Historian for the Metropolitan Museum of Art and a special agent with the FBI. Reading about what was happening behind the scenes in The Rembrandt Affair will make you want to be "007" too! 3. What three words would you use to describe the character of Gabriel Allon? Determined, Honorable, Highly intelligent. 4. THE REMBRANDT AFFAIR takes the reader all over the world. Of all the locations mentioned, which would be your ideal vacation spot? There are so many wonderful locations in the book, but I would love to visit Israel. Beautiful and rich in history I think it would make for a very special vacation. 5. Art theft plays a major role in the novel. If no crime were involved, what piece of art would you like to have in your home? Renoir, Picasso, or any painting by the French Impressionists would be welcome on my walls. A beautiful pastel by Mary Cassatt?! Starry Night by Vincent Van Gogh or A Sunday Afternoon on the Island of La Grande Jatte by Seurat ?! But I think I would love to have The Dream by Henri Rousseau most of all. Henri Rousseau was a self taught artists and his jungle scenes are beautiful. The Dream was his last painting. 6. Zoe Reed is a powerful female character in the novel. Tell us about an influential woman in your life. My mother has been a powerful force in my life, giving me the tools and knowledge to be the creative woman I am today. 7.Who was your favorite "good guy" in THE REMBRANDT AFFAIR and why? Of course my favorite good guy would have to be Gabriel Allon, he is just the most honorable character with such a strong force within him to fight for what's right. But, I would also like to add Mikhail Abramov aka Mikhail Danilov to my "favorite guy" answer. Mikhail goes undercover in a very dangerous mission with Zoe Reed, and even in the face of death, Mikhail forsakes his own life to protect Zoe. That is dedication and makes Mikhail one amazing man. 8. All of the technology discussed in the novel is real. Does any of it surprise you? We are so bombarded with amazing technology every day that no, none of the technology in the novel surprised me, but I did enjoy learning the fact that when a cell phone or lap top, for example, was "bugged", that the agents referred to it as "owning" that piece of equipment. 9. What celebrity would play Gabriel Allon if THE REMBRANDT AFFAIR were on the big screen. I have always thought that Gabriel Byrne would make a perfect Gabriel Allon. I just loved him in Point of No Return, and in that movie he played a top secret government agent that recruited and trained assassins. 10. Which fellow book-loving friend do you think would enjoy THE REMBRANDT AFFAIR? Tag them here and we will mail a finished copy of the novel! My first thought of who would enjoy this was fellow blogger, Cym Lowell, because not only is he an author in his own right, but he has also written an international thriller. Enjoy Cym! About the Author... Daniel Silva is the #1 New York Times-bestselling author of The Unlikely Spy, The Mark of the Assassin, The Marching Season, The Kill Artist, The English Assassin, The Confessor, A Death in Vienna, Price of Fire, The Messenger, The Secret Servant, Moscow Rules and The Defector. He is married to NBC News Today correspondent Jamie Gangel. They have two children, Lily and Nicholas. In 2009 Silva was appointed to the United States Holocaust Memorial Museum Council. Learn more about the author & his books at Daniel Silva's website! 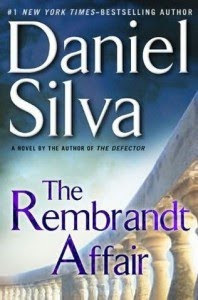 I want to thank Lisa of TLC Book Tours for inviting me to be part of Daniel Silva's book tour for The Rembrandt Affair! I really enjoyed the book. It was quite a page turner and I got to visit with my old friend Gabriel Allon again! And BTW, you can enjoy reading The Rembrandt Affair without reading any of the other previous Daniel Silva books, they are stand alone stories. Daniel Silva's Book Tour for The Rembrandt Affair is winding down, but you can check out the other Tour Hosts at TLC Book Tours. *P.S. This Book is Kindle Ready! I have not read any of the Gabriel Allon books but after reading your review of this one I think I need to hunt them out! It sounds like a very fast paced, constantly on the move type story. It sounds like a great cast of characters. This was so fun to read! Oh, and I thought you might like to know that Daniel Silva posted a link to your tour stop on his Facebook page.. so cool! Thank you so much for being on the tour. I hope you enjoyed the different format! Daniel Silva really can make you turn those pages and The Rembrandt Affair had such a great story line, and easily kept your attention! Heck, I read it in just a few days because I couldn't put it down! Thanks so much for inviting me to be on the book tour! It was a such a great read! Ooh, and "I'm" on Daniel Silva's facebook page! :-) That is very cool!